A trio of designers propose a new design identity for Kuwait with this series of 46 chairs, made using a hybrid of traditional foam cutting and sand casting processes. 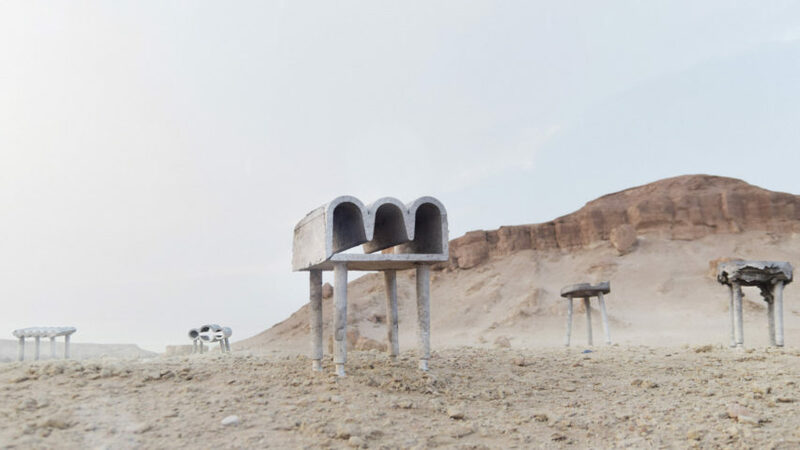 Presented at Dubai Design Week, Desert Cast is the project of three Kuwait-based designers: architect Jassim Al Nashmi, product designer Kawther Al Saffar and architect Ricardas Blazukas. The design of the chairs is reminiscent of the kitschy Greco-Roman-inspired architecture that is popular in the country. They have a variety of distinctive zig-zag, jagged and wavy seats based on architectural mouldings, and stand on three or four thin metal legs. But they also explore a possible future design identity for Kuwait, by creating a new combination of two longstanding local techniques – foam cutting and sand casting, using gypsum profiles. According to the designers, Kuwait has struggled to develop its own context-based design identity, due to the copying of Greco-Roman decor. "They want something chic that makes them look like they have a lavish life," Al Nashmi explained. Locals easily reproduced the elaborate style – in grand mansions and modest homes alike – using gypsum-moulding, an affordable technique. It was so popular that the Italian names of the styles were translated into Arabic, and became well-known phrases with Arab architects. The designers grouped the chairs according to these nine different styles: Rodhún (Rotunda), Coloseum (Coliseum), Danteel (Dentil), Âyooni (Ionic), Ishtiqâq (Pediment), Corinthian (Corinthian), Córneeshe (Cornice), Ifreez (Frieze) and Ri-wâq Bi-á'mida (Portico). "We didn't want to dismiss this fact as part of Kuwait's history," Al Nashmi said of Kuwaitis' fascination with Greco-Roman decor. "This exists. We want to build on it but in a more positive way, with something that is a bit more local – and that's why we looked at sand casting." Sand casting is a very common industrial technique in the country. "It has been done in Kuwait for so long that it is now part of the heritage," the designer explained. By adding foam – a very common local material – into the equation, the trio created a hybrid process, using techniques and materials in a new way. Foam is a popular material in Kuwait, especially for secondary school students, because of its low cost and malleability. "Foam is used in education and became part of our culture, but in a very cheap way," explained Al Saffar. "People would cut it, paint it… There are even art centres that are dedicated just to foam." The designers saw the value in the material, as it can expand what one can cast, so they combined it with sand casting. When the foam is put underground in the sand, and metal is poured in, the foam dissolves and the metal takes the shape of the foam. The hybrid process is very fast and cost-efficient. "In Kuwait, they do things very quickly. They don't want to use extra moulds, so this is very fast," Al Saffar said. "In half an hour, you get a stool." A kitsch Greco-Roman-inspired profile provided the form of each of the 46 stools. These profiles were first cut in foam and then used to cast complete metal stools by master craftsmen at Alwafi Foundry, a local foundry. Some of the chairs are cast using coarser Kuwaiti sand (as opposed to Egyptian sand) which produces more interesting, texturised finishes that are left uncleaned. As well as proposing a new Kuwaiti design identity, Desert Cast also aims to promote a stronger relationship between local designers and craftsmen. According to the designers, the majority of craftsmen in the country view production as simply selling to the consumer. "They are still wary of the process of the designer getting involved and creating a market for them," Al Saffar explained. The designers want to introduce Kuwaitis to the design process, and at the same time, to show how accessible fabrication methods are in the country. Through the project and progressive collaboration, they want to create a local "maker" identity that is beneficial for all parties. Desert Cast represented Kuwait City in Abwab – the centrepiece exhibition of Dubai Design Week, which was held from 12 to 17 November 2018. Abwab is a showcase of design concepts from the Middle East. Amman, Beirut, Dubai and eastern Saudi Arabia also took part in the exhibition. Other recent projects from Kuwait City include Rock House by AGi Architects, which features a faceted stone-clad exterior reminiscent of origami.